This leaflet is an advertisment for Jenson's Cod Liver Oil. 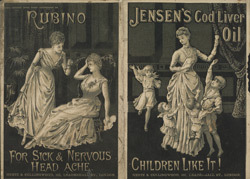 Many physicians prescribed Cod Liver Oil in the 1800s and a daily dose was given to children and adults to help prevent rickets and to keep joints supple. It’s popularity only started to decline in the 1890s when vitamin tablets became available.